Coming off a dream season in 2017, the Nashville Predators are favored to win the Stanley Cup Finals. After beating the Colorado Avalanche in the opening round, the Preds will play the Winnipeg Jets – who have the highest average asking price for a ticket on the secondary market – beginning Friday in Nashville. There’s plenty of enthusiasm swirling around Nashville and demand is driving prices to an all-time high. According to TicketIQ.com, the average asking price for Predators tickets for a second-round game at Bridgestone Arena is $545, the highest in Predators history and third highest across the NHL this season. The most expensive average asking price is for a ticket in Winnipeg ($632). The cheapest average asking price is in Pittsburgh, at $240. The highest average asking price for a game in Nashville is for an if-needed Game 7, which is currently at $720. A potential Game 5 is the second most expensive at $629 while Game 1 is third at $437 and Game 2 has the least expensive average asking price at $431. The get-in price for Friday’s game is $125, the lowest of the series, while the highest get-in price in Nashville is $299 for Game 5. Nashville, an expansion team in 1998-99, has been to the playoffs for each of the last four seasons and 11 of the last 14, since first qualifying for the post season in 2003-04. In 2016-17, the Preds were a surprise participant in the Stanley Cup Finals, where they lost to the Pittsburgh Penguins. That was Nashville’s only appearance in the final series and only the fourth time it got past the first round of the playoffs. Tennessee isn’t exactly a hockey hotbed. But ever since the Predators came to Nashville at the tail end of the 20th century, the city has embraced its team. The Predators didn’t qualify for the NHL’s post season until their sixth season, and ever since, they’ve given the home of country music a reason to sing. Since 2003-04, the team has only failed to qualify for the Stanley Cup Playoffs three times. 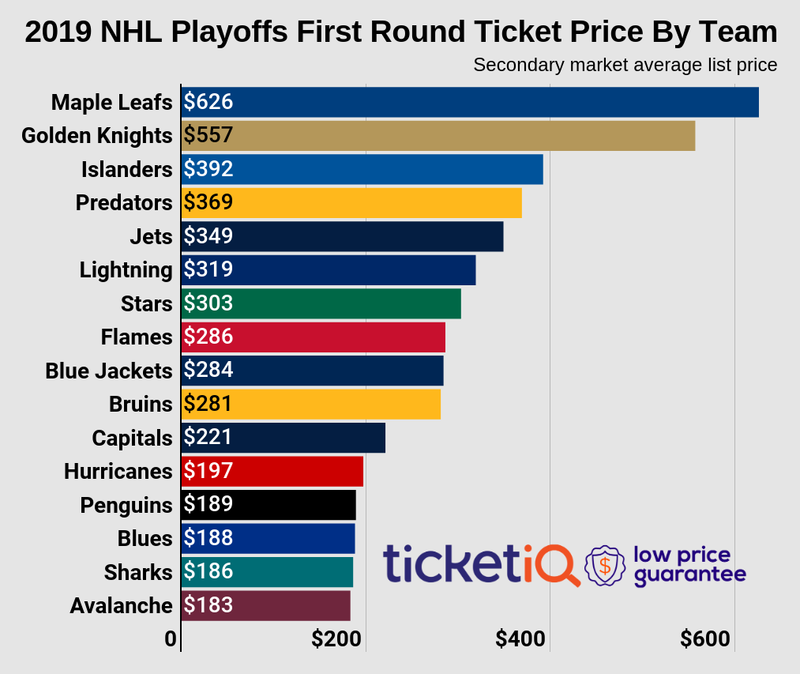 Coming off a stunning season that was capped with the franchise’s first and only appearance in the Stanley Cup Finals, the average asking price on the secondary market for post-season tickets is soaring. According to TicketIQ.com, the current average asking price for Predators playoff tickets for their series against the Colorado Avalanche is $381. That number represents a 31 percent increase over playoff tickets last year, and is the third most expensive in the NHL. The most expensive ticket is for Thursday’s Boston Bruins at Toronto Maple Leafs Game 1 ($652) and the second most expensive is for Wednesday’s Minnesota Wild at Winnipeg Jets Game 1 ($489). The Preds lost in the Stanley Cup Finals to the Pittsburgh Penguins in six games in 2016-17. Predators playoff tickets have seen a fairly steady climb over the last five years. In 2015, the average asking price for a playoff ticket was $223. It dipped to $179 in 2016 before jumping to $290 in 2017. The Predators, winners of the Central Division, finished the regular season with the second-best record in the league – 53-18-11. Only the Tampa Bay Lightning (54-23-5) won more games. Both the Jets and Vegas Golden Knights won 52 games. Nashville finished the season with back-to-back wins. The Preds and Avalanche have played each other 78 times, and Nashville holds a 42-31-5 advantage. The teams have never met in the playoffs before.